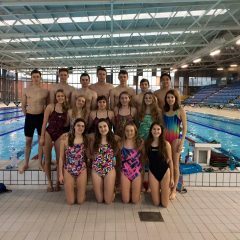 University of Exeter Swimming Club have had some amazing achievements at the BUCS Swimming Championships 2013 and the annual swimming Varsity at the Pyramids Leisure Centre in the past few weeks. Special mention goes to EUSC Men’s Captain Ilya Skliarov who came 5th in the final of the Men’s 50m Freestyle out of a total of 120 competitors; finishing with a time of 23.85 to qualify for the GB trials. Ilya also had fantastic swims in the Men’s 100m Freestyle and 50m Butterfly; finishing 19th and 15th out of 106 and 105 respectively. The remarkable girls relay teams had their best ever performance and made it into two B finals. Phoebe Weaver, Rachel Vaughan, Adele Marsullo and Laura Froshaug made up the Exeter Women’s 400m Freestyle Team in the B final with a time of 4.28.63 smashing their entry time by over 8 seconds and finishing 9th. The Women’s 400m Medley team of Christine Howie, Rachel Vaughan, Adele Marsullo and Laura Froshaug finished an impressive 9th in the final with a time of 5.10.47 out of 42 teams. The Men’s team also performed exceedingly well with the 400m Freestyle Relay team touching in a time of 3.53.20 whilst the 400m Medley Team raced to a respectable time of 4.26.73 with both Men’s relays finishing 26th out of 50 teams. There were more notable swims from James Marshman and Sydney Robertson in the Men’s 200m Freestyle, and Hilary Davey and Vicky Dewar-Fowler in the Women’s 50m Breaststroke. In the Men’s 100m Backstroke (an event won in style by World Record Holder Liam Tancock), EUSC’s squad captain Daniel Crawford came 32nd out of 67 swimmers, narrowly beating fellow Exeter swimming Rob Moran by less than a second. Callum Bailey, Timo Tolppa, Ronny Tang, Stephen Tucker and Rachel Laurence also performed well in their respective individual events. Well done to everyone who helped EUSC achieve one of its best results to date. EUSC’s Varsity event surpassed all expectations and was a brilliant event to spectate. The Exeter A Team defended their title as winners, narrowly beating their rivals Bath by 8 points closely followed behind by the narrowest of margins of 1 point by Southampton. Portsmouth also proved strong competitors, and managed to beat the Exeter Legends Team and Exeter B Team. Over £550 were raised for this year’s chosen charity- the Penny Brohn Cancer Care charity. Club President Rachel Laurence commended EUSC saying: “The amount of money raised is a testament to everyone’s efforts in the planning and smooth running of Varsity, I am very proud of the hard work that was put in to make it such a great success”.